N8OB OH "No sigs at all on 80 this evening." W6OQI CA Connie, nothing heard from you on 160 meters. Your 80 meter signal was nice and strong with minimal Doppler shift. Your 40 meter signal was not as strong as your 80 meter signal. Also your 40 meter signal had a lot of Doppler shift here in Southern California. VE2ZAZ QC Good copy on 80M and 40M (despite contest) but nothing heard on 160M. I Could not stay up for WC. Thanks! N3UC VA Our 1st FMT, had Fun. Lots of Doppler on 80, not too sure how we did on that one. AF9A IN Thanks Connie. Couldn't hear or see you in the multitude on 40M. WA1ABI RI Very good signal on 160, QRM on 40m on both runs. Thanks Connie and Marvin, and GL to all in ARRL FMT. K5CM OK Marvin, good copy on 80 and 40 meters. Thanks for doing the west coast run. W3JW VA Signals were all in the range of weak readable to good readable with considerable QSB. The only signal without noticable doppler effects was the 160 meter transmission. With the directions given in advance, there was no problem with finding" the test signals. This was a good rehersal for the upcoming ARRL FMT." WB9FIP WI Propagation was challenging on all bands. Definitely kept busy with this format. Thanks to both Marvin and Connie for the ARRL warm-up! N5PWG TX 160 M SIGNAL VERY, VERY WEAK;it took me about 7 minutes to find it just as you were signing.I think it was 40 m that had CQ SS" ( thought that wasn't supposed to start until the week end) WC: some signal sat on the test signal (80 m) right at the last 60 sec. keydown period. Many thanks for the chance to brush up before the ARRL test." 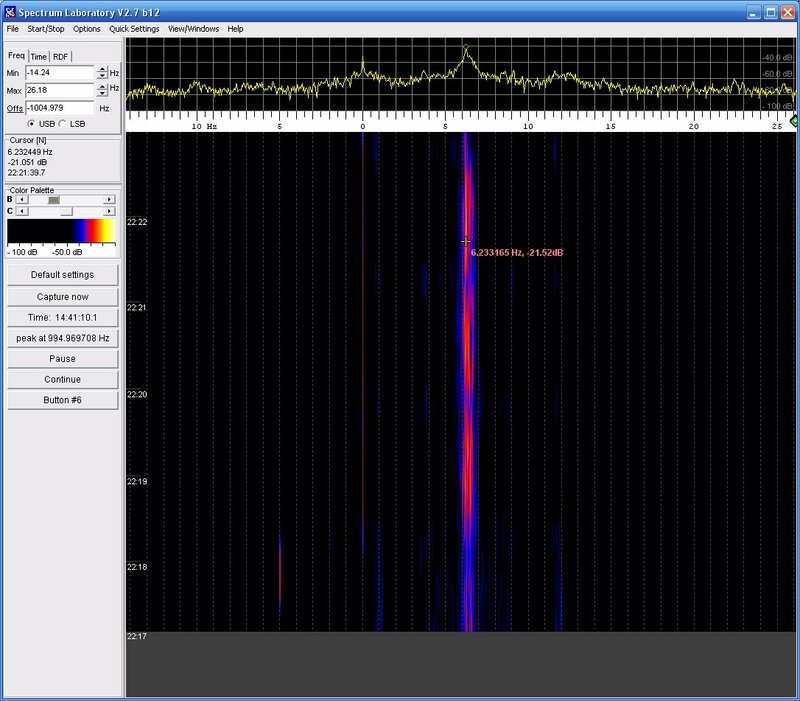 Spectrum Lab screen capture of W6OQI 80 meter run. My marker is on the left at zero Hz. I think several missed me on 160 meters because I had to move up several kHz to get away from all the SSB QRM . I was surprised to see 40 meters so busy with the CW SS guys doing their practice secession. Other than that conditions seemed normal considering were at the bottom of the sun spot cycle. A HP-Z3801 GPS clocks a HP-3336B and a PTS-250. A small 10 db transistor amp follows and drives a 12BY7 / pair 6146. Then to the final amplifier, a Dentron 2500 at 300 watts output except on 30 and 17 meters where the power is 75 watts. There are no mixers or any device in the chain of amplifiers that might impact the accuracy of the HP-Z3801. As a reality check, I periodically log the HP-Z3801 against WWVB.